Rates starting at $99.00 a night for ocean view in heart of Kailua-Kona. 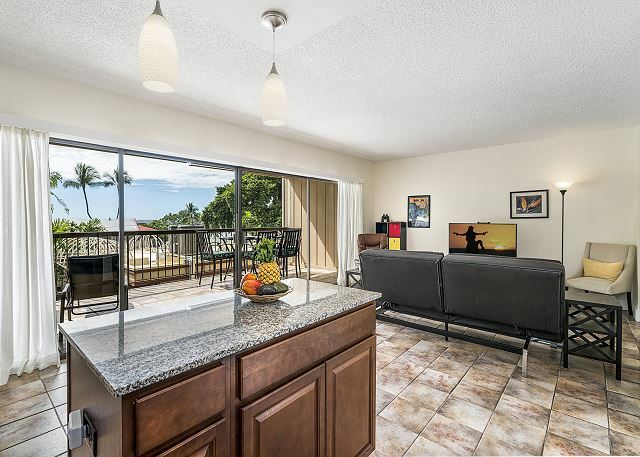 This beautifully remodeled ocean view 2 bedroom, 2 bath corner unit with wrap around lanai with views of the mountain is in the heart of Kona Village! The complex is right in the middle of town, surrounded by shops, galleries and many wonderful restaurants. From the pool deck there is a lovely view of Mokuaikaua, the first Christian church in the Hawaiian Islands. The complex offers secure underground parking. If you are looking for nice, clean and right in town, look no further. Conveniently located in downtown Kailua Kona. 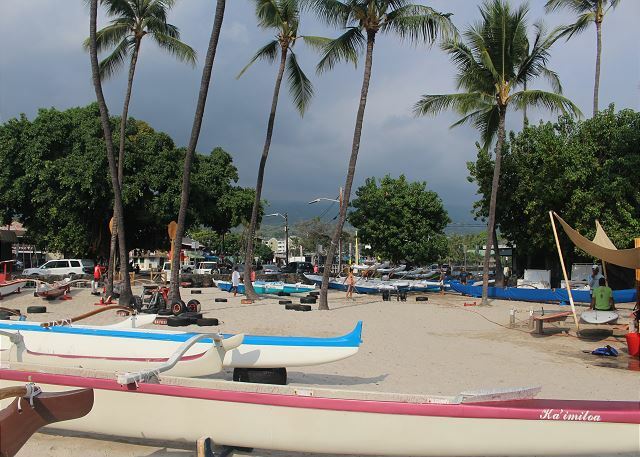 Explore downtown historic Kailua Kona. 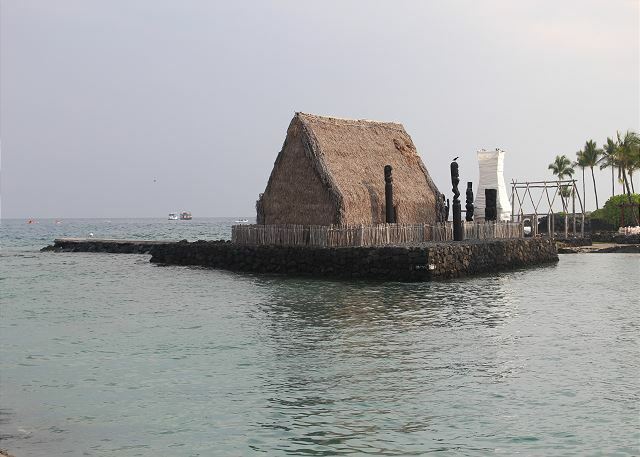 The town of Kailua Kona "hides" some very important Hawaii Island historic spots. 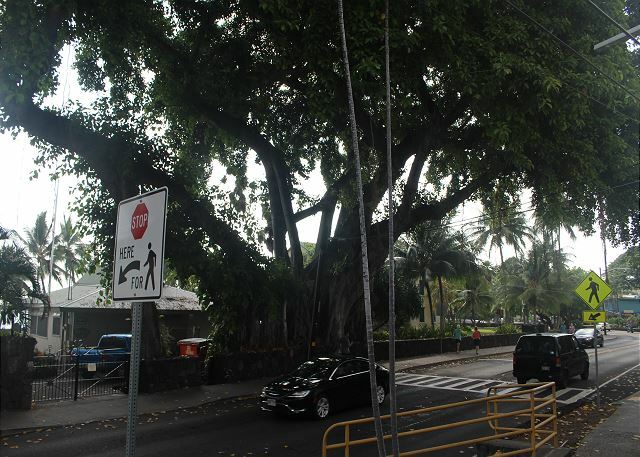 Both the Hulihee Palace and the Mokuaikaua Church are located on Alii Drive. King Kamehameha I spent his last years living near the current site of the King Kamehameha's Kona Beach Hotel until his passing in 1819. The Ahuena Heiau, located on the grounds of the hotel, is a reconstructed temple rebuilt by Kamehameha himself and is on the register of National Historic Landmarks. 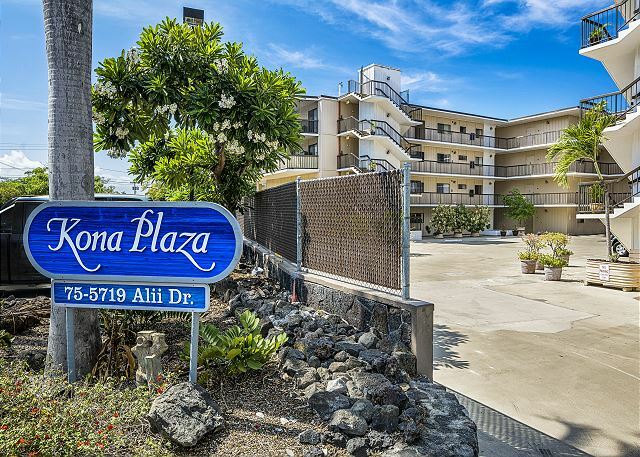 Kona Plaza is conveniently located, a great home base to explore the many wonders of the Big Island of Hawaii including the Volcano National Park, Mauna Kea Observatory, coffee and macadamia nut farms, artist communities, and more! We loved the location of the property and that we had access to a gated parking lot. The property was perfect for our family and we were right in the heart of Ali'i drive. 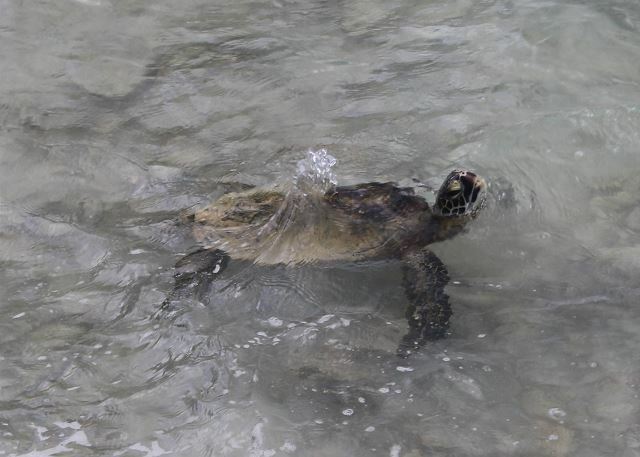 We were able to walk to all the shops,walked to our favorite restaurant Humpy's and even to one of our favorite swimming spots Kamakahonu Beach. We would stay here again! Thank you for posting this 5 star review of your experience at Kona Plaza 201! We are happy to hear you had a beautiful stay with your family at an excellent location in the heart of Ali'i Drive. Thank you. We hope to see you guys again soon with our coveted repeat visitor rates which are the best you can access. 4 adults, 9 days. Awesome location. Car was parked a lot with EVERYTHING in walking distance. We would highly recommend this place. Thank you for posting this 5 star review of your experience at the property! We are happy to hear you had a beautiful stay with an excellent location. Thank you. We sincerely hope to see you guys again soon. Great location and comfortable apartment for 2 couples. Nice balcony and views. Thank you for posting this review of your experience at the property! 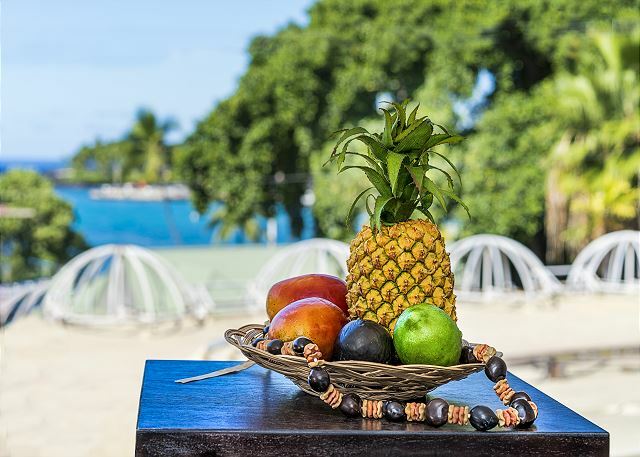 We are happy to hear you felt comfortable and could take advantage of the beautiful views. We sincerely hope to see you guys again soon. Simply remember that the best possible rates are found directly through Boundless Hawaii. It is a big pretty apartment, that has everything you need. One whole side has a glass door to a big balcony - outside light would be nice. You can see the ocean behind the (not so [pretty ) rooftop of a restaurant. You are in the middle of shopping, restaurants, so of course there will be some street noise - not much. We loved the keyless door until the moment when the code was changed exactly at 11 am the day we left - and we were locked out (our mistake of course). This was handled very nicely and professionally. Thanks! Thank you for posting this 5 star review of your experience at the property! Thank you for the feedback. We sincerely hope to see you guys again soon. Simply remember that the best possible rates are found directly through Boundless Hawaii. Very clean and modern 2 bedroom 2 bath apartment. Safe and secure underground parking. Close to restaurants, shopping and beaches. Plenty of bath and beach towels provided along with other beach nessecities like umbrellas and boogie boards. Even though the building is right off of Alii Drive, with the sliding glass windows closed, it is super quiet. Grocery stores are a 3 minute drive up the hill and it’s a good idea to stop there before you arrive to pick up things like bottled water, cooking oil and coffee filters as these were not available in the kitchen. The management company was awesome and very helpful. I would definitely stay here again and recommend this place to others. Mahalo Anne, we thank you for writing such a detailed review of your stay which is bound to be beneficial to future travelers. We sincerely hope to see your group again soon. Simply remember that the best possible rates are found directly through Boundless Hawaii. My husband, 17-year-old son and I stayed for a week. This condominium is located right in the middle of the village and is within walking distance to everything at either end of the village. It is quieter than we expected being right on the main area. We would definitely recommend this to friends and use this resort again. We thank you for posting this 5 star review of your experience at the property! We sincerely hope to see your group again soon. Simply remember that the best possible rates are found directly through Boundless Hawaii. 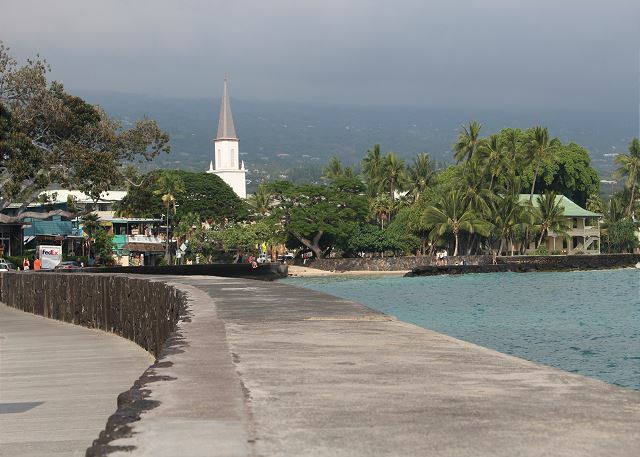 This central location, overlooking the cute main street of Kailua-Kona, was super! And you could also see the ocean/bay! Found a favorite Kona coffee shop just down the block! We so appreciate your review! Glad to hear the stay with us was as perfect as we intended! We hope you'll stay with us in the future and take advantage of the returning client discount! Nice Unit to watch street activity on Alii. Some harbor view. Clean. Desperately needs blackout curtains in bedroom. Drapes in L.R. very much in need of updating. Furniture a little minimal. Overall a nice place to stay. Thank you for your feedback, these kind of constructive comments allow us to better the next guests experience with us! We have since replaced the curtain in the bedrooms with black out curtains to reduce the light pollution. Additionally we have updated some of the guest amenities for your comfort. 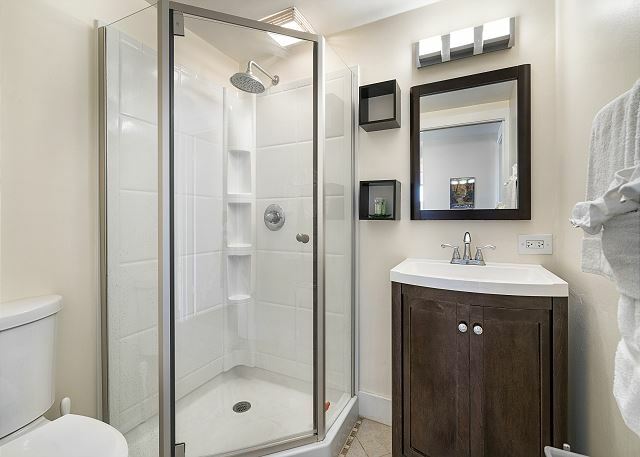 The property was just as described - neat, clean and freshly remodeled. The view from the Lanai was amazing. We ate many meals on the patio furniture while looking out over the town and the ocean. 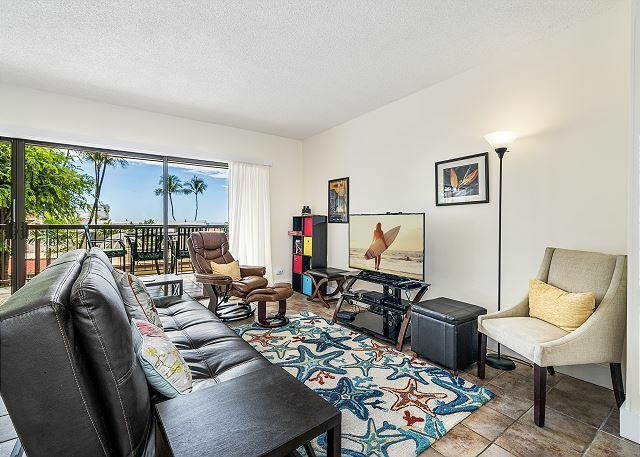 This condo provided the perfect location for our family vacation, right in the heart of Kona within a few feet of great coffee, dining and shopping. Thank you for your wonderful review! We love when guests share details to enhance the next guests' experience. We're happy that you enjoyed your time; we would love to host you for your next visit. Please stay with us again for a 10% discount as a returning guest! We stayed in 201 from Sept. 25-Oct1st. Everything was wonderful. The unit is lovely. I would have liked to have had more clothes storage. The empty spot in the hallway would be a great place for drawers, shelves. Maybe some Tupperware or Rubbermaid containers would be good to have. Thank you for visiting with Boundless Hawaii. We are glad to hear the you enjoyed your time in the condo. We appreciate your recommendations, as this helps us offer the best services to the next guest. Mahalo! Thank you for staying with us for your annual visit! We look forward to seeing you next year. Everything was as it was described, including the furniture. Very clean and comfortable. Easy access to restaurants and stores regardless if you're on foot or you have a vehicle. When we stayed there the weather was VERY hot that the AC had to work harder. Took awhile to get cool. Other than that, everything was perfect. I would recommend this rental. Mahalo for visiting and sharing your experience and kind works. 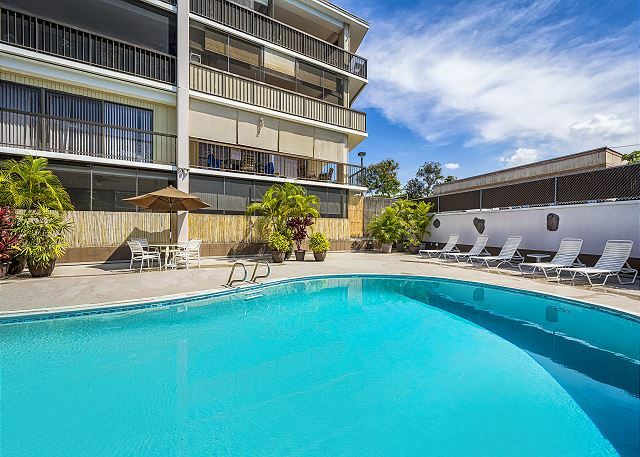 This condo is a wonderful balance of quality and budget, conveniently located right off of the Kailua Bay pier. We are so happy that you enjoyed your visit and were able to find an escape from the Summer heat. Please let us plan your next escape! As a returning guest you are eligible for a 10% discount. Aloha and thank you for your review. We are happy to hear that you enjoyed your visit. Please let us know when you return. We would be happy to extend a 10% discount for your next visit when booked through Boundless Hawaii directly. Aloha! Thank you for visit and taking the time to leave a review. Please book with us directly for your next visit and you will receive a 10% discount! 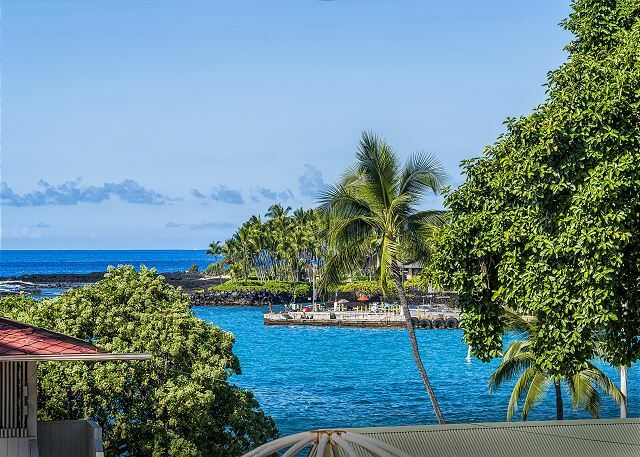 Fantastic 9 night stay in a great unit in a perfect Kona location!!! Great! It was exactly what I expected. The location was perfect & we happened to be there for the local Christmas parade & Sunday street market which was an unexpected treat. Lots of great restaurants just steps away, too! Boundless Hawaii is truly boundless!! This is our second time in this beautiful unit and we fell in love with it all over again! We had a minor maintenance issue that was resolved the same day...all Boundless Hawaii staff are very professional and friendly and made us feel very welcomed. Love love love this property and their management. Good location with easy walk to beach/shopping/restaurants. Our only issue was overriding the program for the AC so that it didn't turn off at night. Got quite warm the first night and didn't sleep well due to that. Otherwise was a great stay. This property is well maintained and has a perfect location (close to beach and restaurants). Enjoyed staying here. We found this condo to be perfect for our needs. The beds were comfortable- a big plus! There were ample towels and there were even some things to help us have fun. ie, Body Board, snorkel equipment, beach chairs, beach umbrellas... There was even a hat! One thing that I thought was very handy, was the information that Boundless Hawaii provided. The app was great too. Everything went smoothly, from getting into the unit, to getting into the underground parking garage. We were told that we needed to check in with the property manager on site. I tried a few times, but my timing was such that she was out of her office doing rounds every time I went down. Finally, I called the number on the door and she answered her phone. I suggest if you go down and she's not there, just call her and she'll come, then you'll be done with checking in. I only gave a 4 for cleanliness... I'm a rather picky clean person. I think a professional cleaning person should have water spots off of bathroom sinks & shower... I know I'll make more as soon as I take a shower or wash my hands, but they shouldn't be there when I get there. Otherwise, it was clean. Overall - Great Place at a Great Location! The stay at Kona Plaza 201 was very pleasant. We enjoyed the seating out on the lani being able to eat our meals out there and watch sun sets. The condo had everything that you could need for a vacation to kona. We loved our stay and would recommend this property to friends and family. Thank you for letting us stay. a guest from San Francisco, CA does not recommend this vacation rental. Not satisfied with condition of property. Sadly, it did not appear to be properly cleaned & inspected b4 our arrival. There were Cockroaches, broken & stained curtains, dirty dishes in cupboards, & dirty floors. Location was good. Company staff was not very helpful until I demanded they do something abt the roaches. I would not recommend the same property to someone else. great location, big space, nice furnishing, great view couldn't ask for more! Great location and very clean. Loved staying here and would definitely stay again. This condo is perfectly located. We stayed for a week and could have stayed a month. Very comfortable place to stay. LIttle bit of road noise but nothing to speak of. Can't wait to visit again. good location. life starts at 7am each day based on outside noise. Enjoyed our stay here. Close to the beach. Nice part of town to walk around! It was a little difficult to find our first night. We drove around quite a while because the address given did not take us to be actual apartment complex. It was 1 am so we weren't able to get ahold of anyone. If you are looking for a place with bathroom inside the bedrooms like a suite this isn't the place. I assumed that the bedrooms were like a master suite. There is 1 King and 1 queen. The place was clean, had everything we needed for the beach, including towels. One day the electric was off the entire day in our apartment because of work being done upstairs so that was inconvenient. The AC worked great! This is unit is in a great location and offers all you need for a family to enjoy a break and share meals together. This unit was newly renovated...very light and airy we just loved this unit for our family vacation of 3. Definitely could have more folks and not feel like you were on top of each other. Incredible value for the price and location. Definitely will book again! 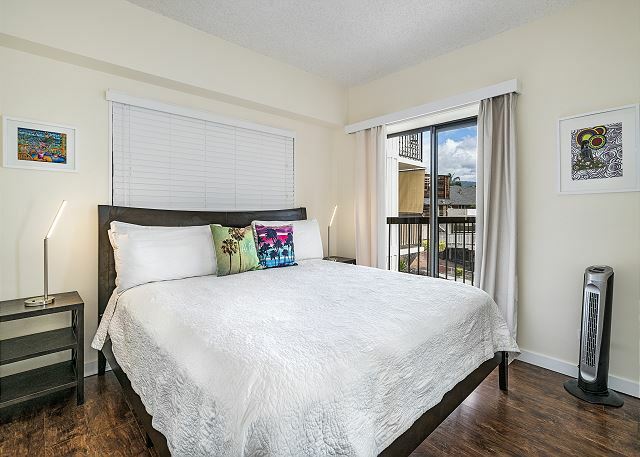 Good location, unit very clean and modern and actually nicer than pictures portrayed it. We had a wonderful time in this great apartment in Kailua-Kona. The property was very clean and well-maintained. It is very spacious and located right in the heart of downtown. You can easily walk to the beach, restaurants and stores. We would definitely stay there again! overall the unit is nice. However, the central AC is on a ridiculous 2 hour timer. We would wake up several times each night to crank the timer. NOT GOOD! The Kona plaza condo 201. The Kona condo was everything we could have asked for. It truly gave us a sense of what it would be like to have a place there. We stayed for 2 weeks because we knew there would be so much to see and do on the island. The condos location was ideal. 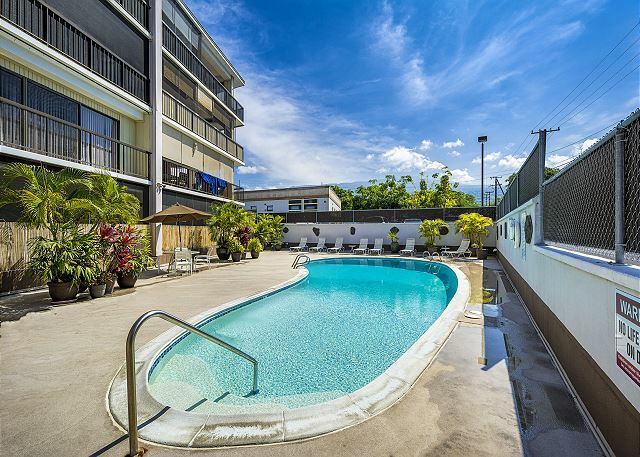 walking distance to dining, swimming and shopping. Perfect. The condo provided everything we needed. We purchased a rice cooker and left it there so when we come back we can use it. Also, a blow up mattress since we have three children. 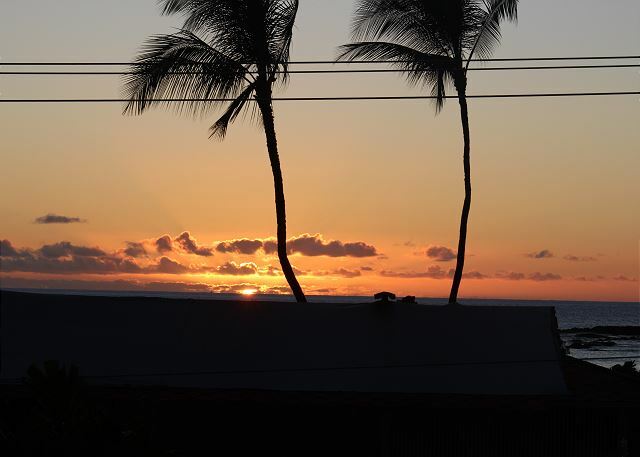 Mahalo to Michael and Laura for sharing your home with us. Super nice , very comfortable ! Me and my wife loved this condo. It's been completely updated and is super clean. We brought our two boys with us and the extra beds were so comfortable, pillows are a big deal when your not sleeping in your own bed, these pillows were good;). Everything we needed to make our trips to the beach was there, chairs, umbrellas, towels, toys for the kids.... Ect... It was great. 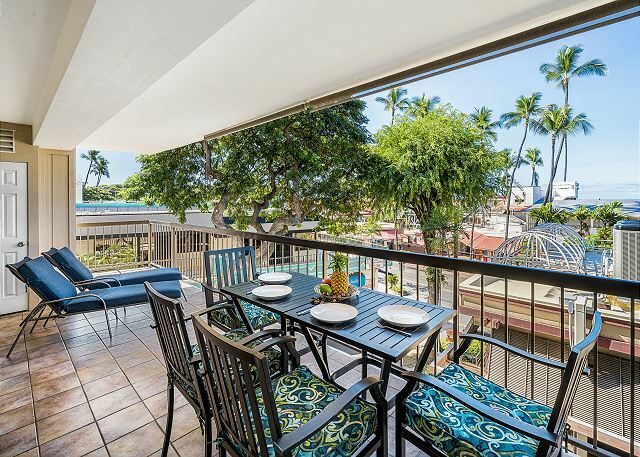 Oh and the lanai, man that was a nice treat to have breakfast on every morning ?? Aloha, our experience with Boundless was amazing!! 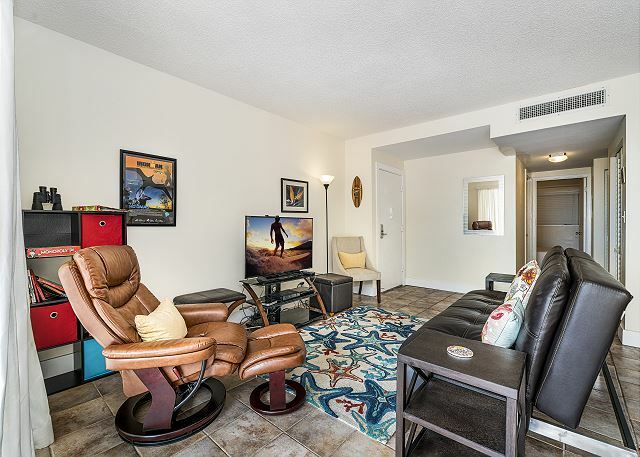 The condo was centrally located to do everything!! 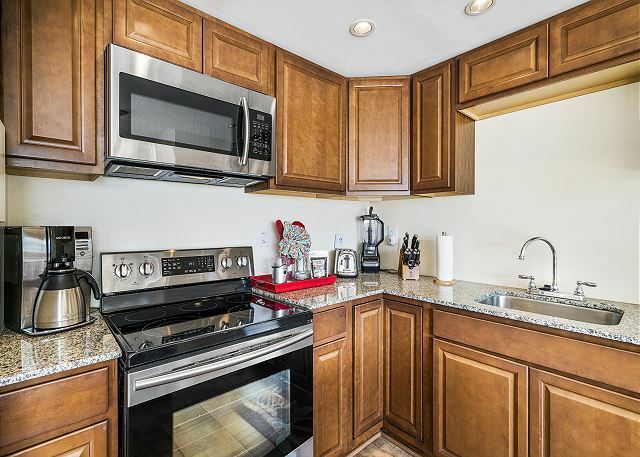 Super clean, great appliances and beautiful balcony!! We would love to come back we're missing our morning coffee on the lanai...mahalo!! My family and I thoroughly enjoyed our stay at Kona Plaza 201. You could not ask for a better location. 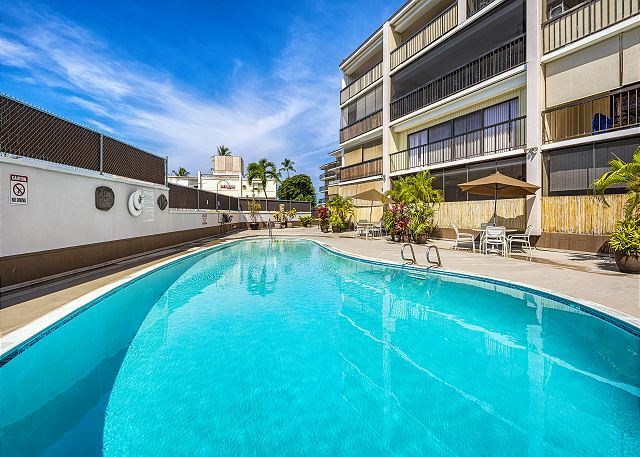 Right in the heart of downtown Kona, conveinently located to so many shops and restaurants. We rented a car to explore the island, but if you have no plans to leave Kona, with this condo's location you really don't need a vehicle. Everything that we needed for the week was provided. We did end up buying (and leaving) a small fan for the back bed room. It doesn't really get hot in that room, but the fan was needed to circulate the air a bit. It would get stuffy at night. Overall, we loved our time here and can't wait to get back! We spent half our stay in Kona and half in Hilo. 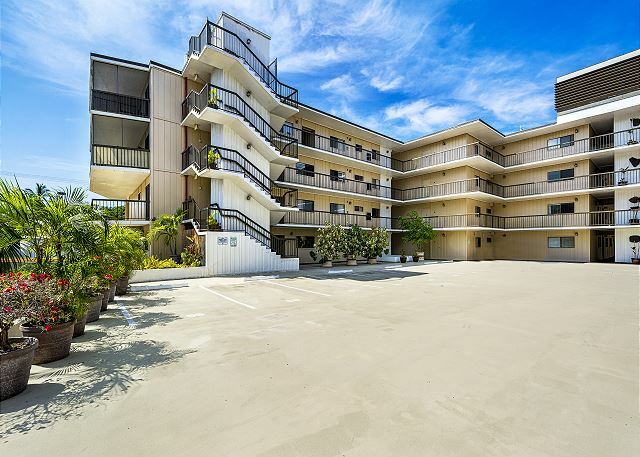 This condo is right in the heart of Downtown Kona. It is a great location to walk to shopping or food! The unit itself was very clean and had everything we needed. The wrap around balcony was great and the open floor plan was nice too. The smaller bedroom is extremely small and just fits the bed(s). But we didn't mind that because our kids didn't spend much time in there anyways. We will use this condo again in the future.